When you think about prepping for pregnancy what is the first thing that comes to mind? I pictured my own personal experience getting myself ready to add another baby to our family. I started eating better, taking pre-natal vitamins and making sure I was getting enough sleep. My perception was that the onus was on the female to do all the important preparations. I thought since I was going to carry the baby for nine months that I was the only one that needed to take these extra steps. What I didn’t really consider was the fact that it takes two to tango, so to speak. The man is essential part of the pregnancy equation. It makes perfect sense to me now, but it was something I did not even think about back then. I was so focused on what I needed to do and didn’t give much thought of what my husband could be doing as well. Some food for thought – the male factor is responsible in up to 50% of couples who are experiencing infertility. When we were struggling to conceive, my doctor told us that they always test the man first since his test was the least invasive. Sperm health and sperm quality begin to decline around the age of 25 and factors like smoking, drinking, drugs, poor nutrition, lack of exercise and even stress can contribute to poor sperm quality. Both my husband and I were 26 when our second daughter was born. We were young by today’s standards with more and more couples waiting till their 30’s and 40’s to start a family. Let’s talk for a second about what HE can do prior to trying to conceive. 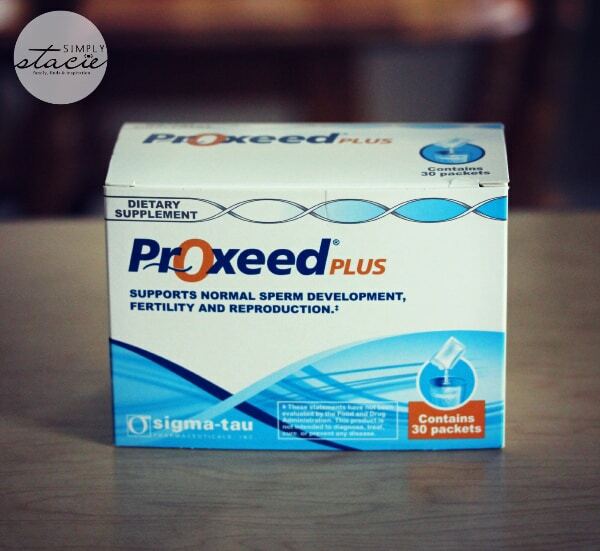 I recently learned about Proxeed Plus, a patented male fertility supplement specifically designed for sperm health. It supports male reproductive health and sperm quality by providing important nutrients like L-carnitine and Acetyl-L-carnitine that are needed for developing sperm. Proxeed Plus has three to four times more carnitine than other men’s health supplements. While the woman is taking her prenatal vitamins, the man can take Proxeed Plus. It’s taken twice per day and comes in packets of powder that dissolve easily into water, juice, smoothies or another cold beverage of choice. With twice daily use, this prenatal male fertility supplement may benefit sperm quality in as a little as 90 days. For maximum benefit, it’s recommended to take Proxeed Plus for six months. Seems easy enough right? I checked out the video series on Proxeed Plus YouTube channel. Board certified reproductive endocrinologist Dr. Michael J. Heard shares information about the supplement, conception myths and more. They are worth watching – I learned quite a few new things about male fertility! Proxeed Plus can be purchased via telephone or online and costs $130 for a month supply (includes two boxes containing 30 packets each). I hope that this information benefits anyone wondering about male fertility or couples prepping to start (or grow) their family. My family is complete, but I’m passing along this post to my sister who is at that exciting stage in her life. To learn more or to purchase, visit Proxeed Plus online or give them a call at 1-888-Proxeed (776-9333).